I went to Whole Foods today, and was again overwhelmed by the bounty that was there. But I knew I had a load of things to do today, so it was a quick trip (my Mum was also with me … that slows and speeds things up in a strange way). It was an in and out shop – and I was thinking of what to make for dinner. There was a huge bunch of gorgeous baby spinach. And there was ready made paneer (a bland Indian cheese that cooks well, and soaks up all the flavour of what ever dish you put it in). And that was it. Tacos for the young-uns (well, the adults had some too), and palak paneer for the adults. It took less than 20 minutes, and it was delicious. 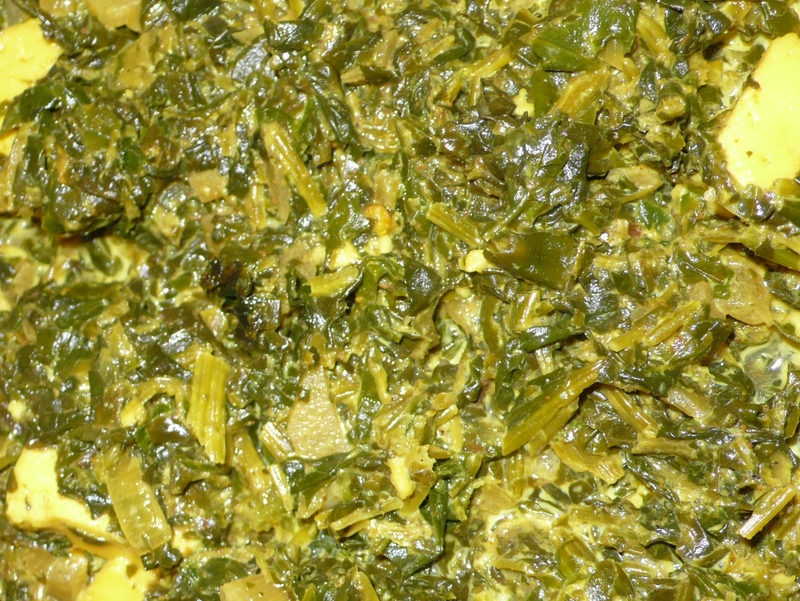 It was also a palak paneer that was cobbled together with what I could find at the shops. I didnt really have access to the kind of spice cupboard that I would have back home. This palak paneer you can make just about anywhere in the world! And the great thing about this dish is that you can make it vegan. Use a firm tofu, ready spiced and baked if possible, and slice it and add. It has the same creaminess as the paneer, and adds similar protein. Use coconut cream (not milk) in place of the cream or milk, and you have a delectable vegan feast. Just imagine a gorgeous green mass, with a turmeric yellow sauce, and creamy chunks of cheese. It was satisfying and healthy, and oh so easy. Just remember to taste and adjust for seasoning. You put in so much spinach that you might well need to add more salt and pepper at the end. 1 packet paneer (about 1 cup chopped) Note: if you cannot find paneer, substitute with Mexican queso blanco, or firm ricotta, sliced and pan fried. Or, if you want to be vegan, add firm tofu, preferably one that has been baked and flavoured. In a large saucepan, heat the olive oil and sesame oil until shimmering. Add the onions, garlic and ginger, and stir to combine. Let the onions soften a bit, and then add the spices and salt and pepper. Let saute for at least 5 minutes or so, on medium low heat. You want the spices to become fragrant, and cook a little. This will impact hugely on the end taste of the dish. Just make sure they dont burn! Add the spinach all at once. Raise heat to high, and wilt the spinach completely, mixing it in well with the onions and spices. Add the water, and let cook down, and taste and adjust for seasoning. Add the milk or cream, and let reduce a little. Adjust for seasoning again, and add the paneer. Cook for at least 5 minutes on a medium low fire. You want the paneer incorporated into the gravy, and you want it to taste of spices and spinach. You can make this ahead at least a few hours. Reheat on low for a few minutes, and serve with rice and some chutney. 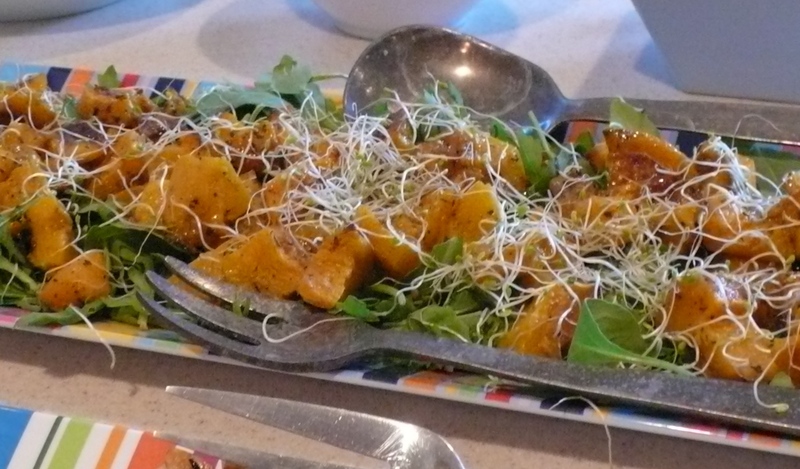 This is another dish from my sister’s feast – the perfect side dish as far as I am concerned. Bright, green, beautiful, and amazingly tasty. Plus, it tastes best if served cold, so you can make it up to one day ahead (though not more) and it will be gorgeous on the day. I love broccoli and broccolini (which is just the baby version)… there is no taste quite like it. I hate it when its boiled to death though, because I think it tastes of *green* and too much cooking just decimates its pure flavour. You can use broccoli in place of broccolini here, but if you can find it, do use the baby version. Its so delicate, very sweet, and incredibly tasty. It needs very little prep too – the stalks are tender, and all you need to do is just trim the edges and slice them into 2 – 3 inch chunks. I like broccoli with anything – in a soup with some aged cheddar cheese, in a gratin (with more cheese), tossed with butter… but I think this is my absolute favourite. The lemon just enhances that very bright clear flavour – and its surprising because we usually expect the broccoli to be heavy and rich. 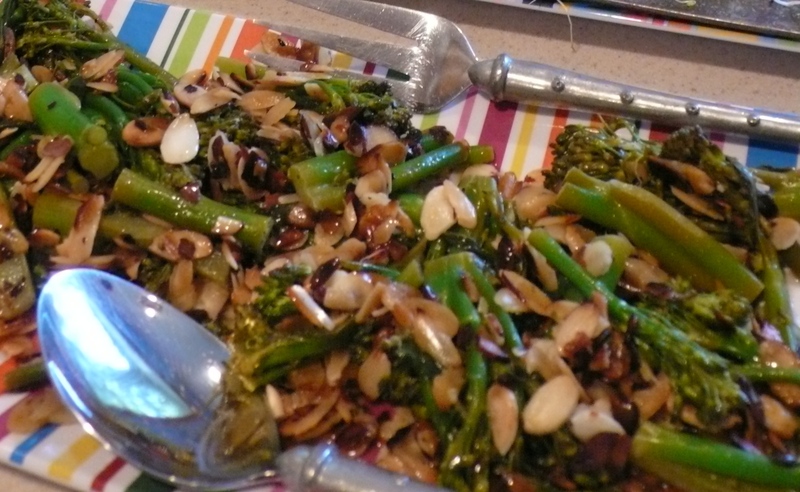 Toasted almonds add creaminess and a nutty richness to this dish – they are a wonderful balance to the lemon and broccoli. Two days after our birthday feast, I used the left over broccolini and almonds as the base for a cold vegetable soup (whizzed up with the help of the adored immersion blender!) 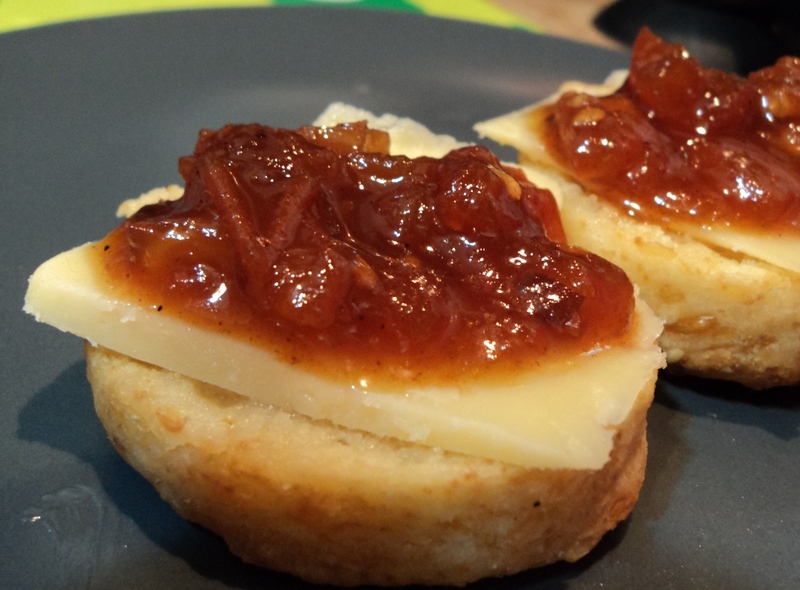 – it was superb – and the almonds added texture and great depth of flavour. You can double, triple, or even halve this recipe. Its great to take on a picnic, and wonderful to serve to hoardes of people. Its a tasty addition to a feast, and a perfect side dish for dinner or lunch. In a dry, non stick pan, over medium high heat, toast the sliced almonds. Use a wooden spoon or spatula to keep the almonds moving in the pan – they can burn in the blink of an eye! Once they are toasted, set aside to cool. Prepare a bowl with water and ice, if possible. If not, have cold water standing by. Also, prepare the lemon dressing. In a large-ish bowl, add 1/2 tsp salt, 1/2 tsp pepper, olive oil, the grated peel of a lemon, and all its juice. Organic lemons have a huge depth of flavour that cannot be matched, and are so worth it in this recipe! Whisk together well. The lemon juice and olive oil will emulsify, and you will have a creamy looking very lemony dressing. Set aside. Fill a large pot with water, and add 1 tsp salt. Bring to the boil. While the water is coming to the boil, trim your broccolini or broccoli spears. For broccolini, just trim the ends, and slice into manageable chunks… I usually just cut them in half. For broccoli, divide the head into florets, and trim the woody bits off the stalk, and cut into bite sized chunks. Wash briefly in cold water. As soon as the water has come to the boil, put all the broccolini in. Watch carefully – you may only need a minute or two. Broccoli might take longer, but you want a crisp tender vegetable, with a little bit of crunch left. Do not over boil. You will lose all the freshness! As soon as the broccolini is snap tender, drain, and pour the bowl of ice water or the cold water over. The broccolini will still be a little warm – this is okay. Shake to drain off as much of the water as possible, and immediately dunk the broccolini into the lemon dressing. Add the almonds, and mix thoroughly. Taste for salt and pepper. Cover and refrigerate for up to 24 hours. Serve cold or at room temperature.